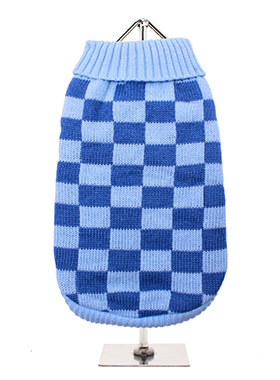 Inspired by the Mod Revival and Ska music movements of the 1970s, Urban Pup presents this fantastically bold checkerboard knitted jumper. In a dark/light blue all over check and contrast ribbed collar, cuff and Hem. Creates a sharp look and a elasticated hem ensures a great fit from front to back. On top of all of that it will keep you dog snug and warm as well.